Join us in this magical city and share the wonderment. I would be most happy to share our secrets and knowledge with you. Contact me at Back Chat or by email at les@leslieback.co.za . I look forward to hearing from you. The French have a wonderful word, ‘flaner’ which means to stroll and wander. To discover a Paris that is all one’s own, one must stroll, wander, pause and watch the passing show. ‘Flanerie’ is practiced by almost everyone, including the French. What wonders one encounters just gazing into shop-windows, inspecting a street-market, or simply idling along watching all the ‘goings-on.’ Everyone has a secret Paris, and this is part of mine. We encountered Paris at its hottest, making flanerie a little uncomfortable, but enchanting all the same. Down the street from our hotel, we discovered ‘Le Palais des Thés’. This unique find, in a small side street, was stocked with 300 different teas and infusions from all over the world. Shelves were overflowing with identical large green pottery jars. The proprietor, hearing a foreign accent, and establishing that we were South African, proudly showed us his jar containing Rooibos tea. We made an instant friend and could have discussed tea for hours. The address of this little gem is 35; rue de l’Abbé Grégoire in the 6th Arrondisment. Incidentally our lovely little boutique hotel, the Hôtel Le Saint-Grégoire is in the same street at 43, Rue de L’Abbé Grégoire 75006. Small, immaculate and decorated by David Hicks, run by perfectly charming people, who thankfully speak English. There was a most interesting night concierge in July and August, who is doing his doctorate in Literature. He’s happy to discuss Dostoevsky or Tolstoy at length with who ever is interested. Having encountered the wondrous tea shop, we came across a fascinating teapot shop, La Maison de Thérèse, 17 Rue de la Odeon. About 95 different teapots, cups and sugar bowls in the window, all sizes and amazing shapes; cats, dogs and elephants! Some exquisite table ware, but totally dominated by the astonishing variety of teapots, reminiscent of Alice in Wonderland. Time for lunch! Something light. Many restaurants are air conditioned, but generally the implication then, is to have a larger meal. We strolled along the Boulevard Saint-Germain and passed the wonderful Les Deux Magots. The people eating at the pavement tables looked distinctly wilted. One or two steps further down, we encountered the equally famous Café de Flore. Like Les Deux Magots, it was a meeting place of literary giants such as Sartre, Simone de Beauvoir and so many others. After the war, Picasso came to Flore every night and sat at the same table, the second table in front of the main door. The pavement tables were equally unwelcoming on that hot day, so we entered to find it just as stifling. A kindly waiter suggested that we try the room upstairs, and that they would switch on the air conditioning for us - what a find! The air conditioning was switched on, the windows closed, and the whole room became a comfortable haven. Other people trickled up the stairs, and soon the place was buzzing and we did not feel that we were on a lonely desert island. We enjoyed Salade Flore with a glass of chilled Chablis. The salad ; eggs, ripe tomatoes, fine slices of emmental cheese, crisp cos and butter lettuce and piquant olives, perfect with a delicate vinaigrette dressing made only the way the French can and of naturally a crisp fresh baguette. How wonderful it is to eat in Paris! The interior is Art Deco, brimming with a feeling of its richly colourful past and of the luminaries that ate and drank there. It is always fun sitting at a pavement café. A cup of superb espresso and one can just gaze at the passing pavement fashion. Everybody smokes in Paris, in spite of the signs offering dire warnings prohibiting it. I think the French would rather go to jail than give up their Gauloises. Cell phones everywhere; everybody talking and gesticulating, and of course dogs; the French adore dogs, and dogs go everywhere. One major discovery is that the pavements are clean. So flanerie is safer. A wonderful exhibition at the Georges Pompidou Centre of Bauhaus furniture and artists of the time. The Centre has been cleaned and refurbished and just glows. Nothing secret about this, but good to know it is a reasonable walk to the Rue De Rivoli, and then another few blocks to that wonderful tea shop Angelina, where they make an excellent hot chocolate. Classic French décor, choice patisserie and great entertainment watching people watching everyone else. Another find; Denise Francelle, quaint and special on the Rue de Rivoli, open since 1938. The owner presided over her dainty and delicate wares until she was well into her 80's before she retired. It is a tiny gem, wooden drawers overflowing with gloves, magical silk scarves, exquisitely embroidered linen handkerchiefs and fine underwear, even garters, but so very discreet. It seems that they have customers all over the world and were quite prepared to post anything I wished to South Africa. The gloves especially caught my attention with a large collection of cotton gloves of all sizes, lengths and colours. So difficult to find. Decisions, decisions - where to eat at night! What an astounding choice there is. L’appart on the right bank at 9&11 rue du Colisée, just off the Champs Elysées is a favoured choice. The name is short for apartment and the décor follows that theme. The refreshing gazpacho that they make in summer is a treat. The rather amazing thing about this restaurant is that it appears to be run solely by really attractive girls, the only man we spotted was the barman. It was suggested that we sit in the library a room with floor to ceiling books and in the summer it is beautifully cool. Gambas, prawns in a superb sauce were a main course. The dessert crepes are a talking point. About 6 plain unfolded crepes are served, tiny, surrounded by fillings to choose from; two styles of confiture, creamy white cheeses and fresh cream. Such fun and a great idea. It is essential to make reservations (Telephone 01 53 75 16 34) and incidentally it is open for lunch. We have a special place where we spend time on a Sunday, the vast and beautiful Luxembourg Gardens. There is a bandstand placed under the trees surrounded by hundreds of metal folding chairs, randomly placed. We try to get there soon after lunch to secure a couple of seats in the shade. At about noon, bands, including those visiting from America, take the stand, and entertain through the whole summery afternoon. It is all free, and there is a little café nearby in the gardens, where ice cream, snacks and drinks are sold. This is within walking distance of our hotel, and a lovely way to spend a relaxing Sunday afternoon. In Paris on a Sunday, finding restaurants that are open is always problematical. We have one or two that we go to regularly. One is that great big Art Deco theatre of dining, La Coupole, and another that we found on our wanderings, Crêmerie Restaurant Polidor. This bustling restaurant dates back to early 20th century. Art Deco in appearance, the walls are decoratively mirrored and gloriously etched with flowers and silver rings. Many diplomas are in evidence and names of a selection of wines are written on the mirrors. It is jammed with tables, and bookings are not taken. The result is quite convivial and you find that you share tables. The service is swift and efficient, and dinner is not a lengthy affair. Champignons à la Grécque and tomates mozzarella were a good beginning. Chicken in tarragon, the main course, was over in an hour. We did not feel rushed however, and there was plenty of time to stroll to Deux Magots and enjoy a coffee. A lovely way to end a lazy Sunday. At 41 rue Cherche-Midi, on the Left Bank in the 6th Arrondisement, we came across a charming boutique, Celimene Pompon, jammed with treasures; beautiful tapestries, embroidery and gifts. It really is remarkable how many small and interesting places one encounters when one is strolling and casually browsing. Wandering around the Marais District, we came across a renowned olive oil shop, Oliviers & Co. at 47, Rue Vieille du Temple. In the store were huge casks some wrapped in sacking, presumably the better quality oils. Apart from a wide variety of oils, there were displays of tapenade and wheat biscuits - delicious! Slotted spoons were available to remove olives from pottery pots. All kinds of olives, large and small, some flavoured, and of course all plump and tempting. There were potted olive plants on sale, and every style of soap and toiletries made from olive oil were available. 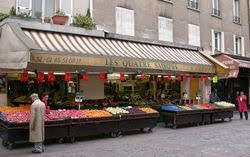 We have found wonderful restaurants in the little side streets, among them the warm and welcoming La Table D’aude, recommended by food writer, Patricia Wells. It is a tiny restaurant at 8, rue de Vaugirard and serves regional dishes from the Aude area of France. The owner chef is totally passionate about his cuisine. Their fish soup is among the best in Paris. How he manages to create the taste and appearance of a Bouillabaisse from the South of France is a mystery? The duck is superb! My husband, Eugene, dared to suggest white wine with the duck, the owner shuddered with horror and suggested that he eat something else or come back another day! Red wine won! He makes the most amazing beans in garlic as a starter, but for this dish one needs a strong French stomach. In the immediate vicinity, there are other favourite restaurants. They are Chez Maître Paul at 12 rue Monsieur-le-Prince with cuisine and wine from the Jura district of France; and La Bastide D’Odeon at 7 rue Corneille. This is a modern bistro where you can enjoy simple but delightful meals. We stumbled upon a corner café, Le Nemrod at 51 Rue de Cherche-Midi. It is a meeting spot for the neighbourhood, where food, service and wine are all good. There is more attention lavished on customers than the usual lunch café. The salads are copious and inventive, and reasonably priced. There are a great many museums to visit, and whilst visiting the Musée D’orsay is no secret, my pleasure is to find something precious and special. They have a way of moving things around, so it is a feeling of achievement when one encounters a familiar favourite. Visit The Jeu de Paume and drink in the amazing Matisse water lilies. Each visit to Paris yields new charms and new secrets. Flanerie remains a fascinating way to discover these secrets. As you stroll, wander and idle along the boulevards and meander through the winding streets, this enthralling city will reveal an abundance of treasures. Endless secrets to uncover and to joyously explore.